Darkside Redding California 530-246-1773 OR Red Bluff California 530-527-9700. Marijuana Growing Books Because Not Only Is Reading FUN But It Is FUN-DAMENTAL. We typically Keep the following Marijuana Growing Books and Guides. #1 Marijuana Grower’s Handbook: Your Complete Guide for Medical and Personal Marijuana Cultivation. Learn how you can consistently grow HUGE, potent buds from Ed Rosenthal. He is one of the world-renowned masters of growing marijuana. Ed Rosenthal is passionate about teaching and growing, and has been teaching people how to grow marijuana for over 35 years. This book is structured almost like a college textbook, with clearly defined sections full of pertinent and well-organized information. I continue to refer back to this book often, because the science is so sound and Ed offers a unquely experienced perspective on growing marijuana..
“Marijuana may not be addictive, but growing it is.” ~ Ed Rosenthal. Whether you’re growing Indoors or Outdoors. This book has you completely covered with all the information you need to dominate your grow and produce the kind of top-quality buds that leave marijuana enthusiasts buzzing. And with over 500 gorgeous pages of full color photos and clear illustrations, this book covers everything. Yes everthing from the standard beginner’s grow guide to much more advanced techniques. #2Marijuana Horticulture: The Indoor/Outdoor Medical Grower’s Bible. This book by the legendary grower Jorge Cervantes. It is hands-down one of the most comprehensive marijuana growing books ever written… but is not meant for beginners. The newest version of this grow bible was published in 2006. It contains 512 full color pages with over 1100 full color photographs and illustrations. Though the book would be several pages shorter if they’d skipped the pages of ads. The 100s of incredible pictures of plants and buds are eye-candy for any grower. Also I think these pictures really are what makes this book so fun to flip through and have on my book shelf. When I first got this book in 2006, I had already been growing weed for 2 years. But this book was one of the main resources that first gave me the ability to start growing plants indoors with CFLs that yield nearly a pound apiece. There is so much information, and it’s usually pretty easy to find what you’re looking for. Even after buying dozens of other grow books, none quite compares to this one. And I still refer back to it when I need to quickly look something up. Now, I don’t totally agree with everything Jorge says, but he does present the information in a way that leaves you able to come to your own conclusions. For one, Jorge does supports the use of pesticides, where I believe there are too many human-safe, natural ways to deal with bugs to ever resort to chemicals, especially for smaller-scale indoor growers. As I said before, this book is probably not the best choice for beginners who are still learning the basics. Though comprehensive in every other way, Jorge assumes that you already have at least one grow under your belt and doesn’t include a beginner’s step-by-step guide. Instead, this book is meant for intermediate to advanced growers who have an understanding of the basics and want to take their growing skills to the next level. If you’ve been looking for a hard copy book you can put on your bookshelf, that you can refer to when you’re tired of sifting through miles of weed forums and internet results, then this gorgeously illustrated grow bible may be the referencebook you’ve been looking for. Or if you have a Kindle, Android phone, or iPhone and want to have this reference with you at all times, then there’s a kindle version available too. 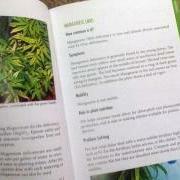 #3 Marijuana Garden Saver: Handbook for Healthy Plants. This book is unlike any other marijuana books on the market. It’s one of the first marijuana grow books I bought and definitely one of the few ones I actually still flip through occasionally. If you’re just starting out, or even if you’re an experienced grower, there’s TONS of useful information and pictures in this slim little book. Definitely formatted like a handbook, you can quickly and easily find whatever it is you’re looking for. Contains detailed information on how to diagnose and fix just about any problem you may face while growing marijuana, whether you grow in water or other hydroponic growing medium, in soil, indoors, outdoors, or just about any way you can grow weed! This book has everything you need to know, including why you’re experiencing your problem, how to prevent it in the future, and all the different ways you can go about fixing it. This is honestly a gold mine of information and any serious grower should invest the couple of bucks it costs to get this books. It’s basically like having a full-time marijuana doctor on call. This book has everything you need! 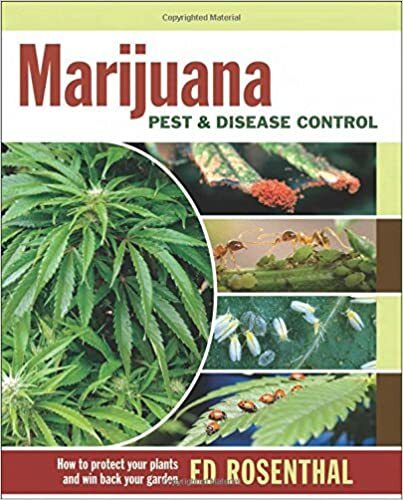 Marijuana Pest and Disease Control: How to Protect Your Plants and Win Back Your Garden. A wide range of pests, diseases, and nutrient deficiencies can zap the vitality of any cannabis garden. Inexperienced gardeners often rely on pesticides that are not registered for edibles. As well as other harmful or ineffective techniques that can render plants unusable. This resourceful guide comes to the rescue, showing gardeners how to win back a garden and nurture plants to their full potential.Uusing safe, organic, and integrated pest management techniques. In addition to providing readers with the know-how to get their plants healthy. Marijuana Pest and Disease Control highlights design and garden practices to prevent future infections. Author Ed Rosenthal gears the book to gardeners at every level of experience and in any growing situation from indoor, outdoor, and greenhouse to hydro and terrace gardens. Extensive color photographs and illustration help identify the exact problem they are faced with. This book would make a great addition to you Marijuana Growing Books Library.